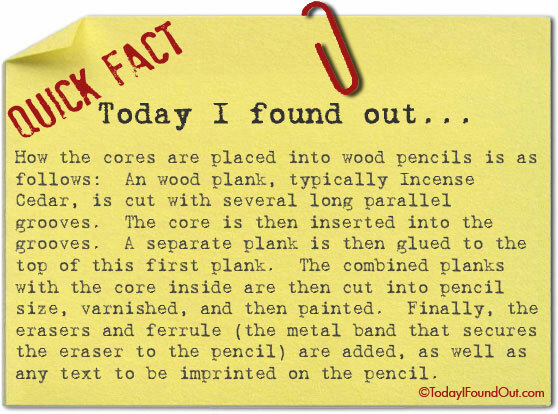 How the cores are placed into wood pencils is as follows: An Incense Cedar plank is cut with several long parallel grooves. The core is then inserted into the grooves. A separate Incense Cedar plank is then glued to the top of this first plank. The combined planks with the core inside are then cut into pencil size, varnished, and then painted. Finally, the erasers and ferrule (the metal band that secures the eraser to the pencil) are added, as well as any text to be imprinted on the pencil.